Stand-alone hardware channel strips became big news in the ’90s as engineers began to migrate to computer–based systems for recording and mixing. Ditching the big desks and racks of outboard effects in favour of PCs and plug-ins brought undeniable benefits: automation got more sophisticated, track counts grew, space was saved. Yet many engineers felt that something else went by the wayside in the process. Digital audio workstations might have allowed them to use hundreds of EQs and compressors on every track, but those EQs and compressors just didn’t sound as good as their analogue counterparts. Many of the hardware units emulated here had fixed, stepped or otherwise restricted time constants, so choosing a compression algorithm from the drop–down list also sets these to appropriate values, along with the separate Knee dial. However, the plug-in’s interface is the same whatever model you select, and all the controls remain active over their full range; so even if, for instance, you select the ‘Stress 3’ algorithm, there’s nothing to stop you moving the Ratio dial to 20:1 or even higher. Likewise, you can happily use super-fast attack times on models of legendarily slow compressors if you want to. This may displease some vintage obsessives, but as URS’s Bobby Nathan points out, the ‘original’ feature set is not sacred; it was common for studios to modify classic hardware to maximise its flexibility, and URS are merely extending the same principle here. 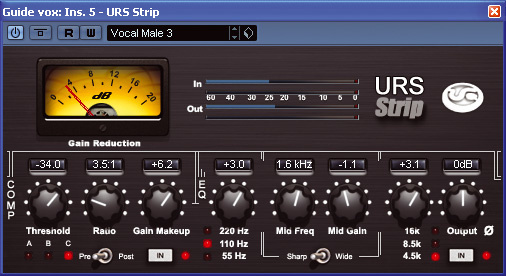 The right-hand half of the Classic Console Strip Pro window is devoted to the four–band EQ. Each band allows you to select one of five algorithms; these, again, mimic classic hardware, but have been given dates instead of names. (I’m not sure why URS have to be quite so coy about what they are emulating!) Few of the original hardware units being mimicked here had bandwidth controls, while most had only a few stepped frequency settings (and in the case of the ‘1951’ EQ, no boost circuitry at all), but as with the compression section, the plug-in controls remain freely variable regardless. The Q setting ranges from 3.0 to 0.25, cut and boost run to 15dB in either direction, and the frequency range covers 1.5kHz to 20kHz (HF band), 220Hz to 7kHz (the two mid-frequency bands) and 20 to 500 Hz at the bottom end. The two outer bands can be switched between shelving and peaking operation. It’s the sound that matters most, though, and if the aim is to create a truly ‘one stop’ processing shop, Classic Console Strip Pro certainly has the sonic bases covered. Whether you’re after bright, in-your-face, screwed–down ’80s rock vocals, warm ’70s folksiness, characterful ’60s colour, or whatever, you’ll find it here. It’s equally at home on other sources, such as acoustic guitar or bass, and I liked it as a mix-bus processor too; the ‘Tape 15ips’ preset, for instance, adds a subtle forwardness and bass boost that can really make a mix sound rounded and complete. In short, then, there’s very little to dislike about Classic Console Strip Pro, but prospective buyers might need to think about how well its ‘one plug-in to rule them all’ philosophy chimes with them. One of the great benefits of mixing in the box is the ease with which you can combine different processors from different manufacturers, and personally, my instinct is often to reach for simpler, single–function EQ and dynamics plug-ins that I know inside out, even though they may not offer the same depth or versatility. What URS have set against that here is the potential to create your own custom ‘analogue’ console by inserting the same plug-in across multiple DAW tracks, and that will be a mouth-watering prospect to many. If you like the idea of a comprehensive channel processor within a single package, and you’re willing to put some time into getting to know it, you should run, not walk, to URS’s web site and download the demo of Classic Console Strip Pro. 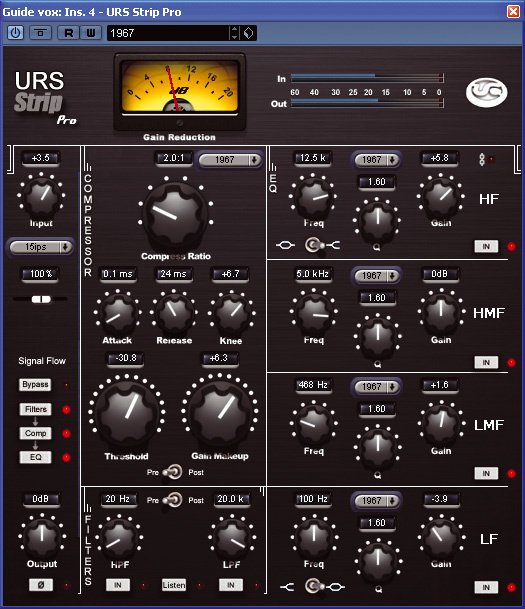 Perhaps the most obvious alternative in terms of emulating a wide range of vintage compressors and equalisers would be Focusrite’s Liquid Mix system, although this, of course, runs on a separate DSP unit rather than as a native or TDM plug-in. You could also investigate McDSP’s extensive range of plug-ins, which likewise feature numerous presets dedicated to recreating old and new analogue gear. Includes details such as the input stage modelling that are rarely found on competing products. 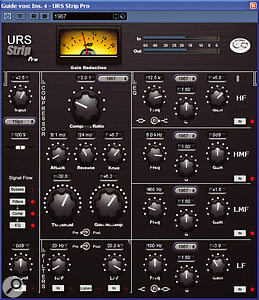 The simpler Classic Console Strip plug-in bundled with it is very worthwhile, and efficient in terms of CPU or DSP resources. A deep plug-in, with some interface quirks, which takes time to explore fully. It would be nice to have a dedicated de-esser section. 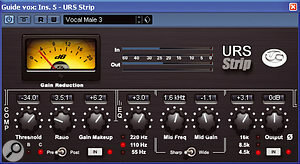 If you like the idea of a vintage channel strip in software, there are few rivals that offer as much depth and versatility as this. TDM version £669.75; native version £334.88. Prices include VAT.